Sinharaja National Park is one of the last pockets of Sri Lanka's once extensive cover of evergreen tropical rainforest and it was declared a World Heritage Site in 1989. According to legend, Sinharaja belonged to the old Sinhalese kings (rajas), who were said to be descended directly from a lion (sinha). Dominated by the tall majestic hora and kina trees, the forest canopy is often over 40 m high and close-galleried, thus providing a shrub-free, easily traversed forest floor. This evergreen tropical rain forest boasts some incredible statistics. Of the many types of trees and lianas, 66% are endemic, and over half of Sri Lanka's endemic butterflies and mammals, including leopards, rusty spotted and fishing cats, sambars, barking deer, wild boars, langurs, squirrels, porcupines, pangolins, mongooses, and bats, live here. Sinharaja National Park is also a particularly good area for spotting lowland endemics and mixed species bird flocks. According to a study of the mixed species bird flocks in the area, 42 individual birds on average occur in the flocks, which makes this flock the world's largest mixed species bird flock. Endemics recorded in the area include the Sri Lanka Junglefowl and Spurfowl, Red-faced Malkoha, Spot-winged Thrush, White-faced Starling, Chestnut-backed Owlet, Black-throated Munia, Sri Lanka Blue Magpie & Sri Lanka Myna. It rains in Sinharaja National Park most afternoons. It does not have the animal spotting facilities or potential of some of the other reserves or national parks, like Yala West National Park, yet just being in the thick of the rain forest is a unique experience and you are not confined to a jeep. Why visit Sinharaja National Park? Sinharaja’s evergreen tropical rain forests boast some incredible statistics. Of the many types of trees and lianas, 66% are endemic. In addition, over half of Sri Lanka's endemic mammals and butterflies, and nearly all of the island's endemic bird species, live here. Sinharaja National Park may be visited on a 4-hour walking safari from either Deniyaya (south entrance) or Kudawa (north entrance). Deniyaya is best reached from Galle, Mirissa, Tangalle, Unawatuna or Weligama, and Kudawa from Colombo, Wadduwa, Bentota, Uda Walawe or the Hill Country. Explore the South and areas near Sinharaja. Hilltop luxury boutique hotel overlooking Koggala Lake and immersed in a tea estate with breath-taking views over the surrounding countryside. 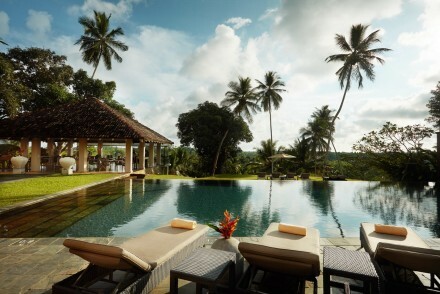 KK is a very special place to stay inland and off the beaten track whilst still within easy reach of Galle and beautiful beaches.